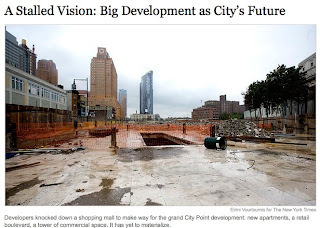 The photo attached to today's front-page New York Times article, headlined A Stalled Vision: Big Development as City’s Future, is of the CityPoint site at the Fulton Street Mall in Downtown Brooklyn, but it could just as easily have been of various parts of the Atlantic Yards site. But Atlantic Yards--well, a segment of it--might get going, so maybe it wasn't the perfect poster child. Still, the development deserves significant mention because it has been enormously delayed: when Atlantic Yards was announced in 2004, the arena was supposed to open in 2006; when the project was approved in 2006, the arena was supposed to open in 2009; and now it's supposed to open in 2012, though uncertainties abound. In fact, Atlantic Yards gets barely a tangential mention in an article that touches on Downtown Brooklyn, Hudson Yards, new baseball stadiums, Willets Point, and more. The mention follows up on an investigation by the Attorney General's office into apparently illegal lobbying by lobbyists for Willets Point, with a revelation that there may be similar questions concerning the Downtown Brooklyn Partnership (DBP) when it comes to AY. That [Attorney General's] investigation has expanded into the activities of the Downtown Brooklyn Partnership, which the city helped create in 2006 to help push through development plans following a broad rezoning of the area. The city awarded the group a $6 million three-year no-bid contract. The group raised another $1.1 million in private donations, tax records show. And Mr. Doctoroff installed a top aide, Joe Chan, to run it. The partnership has become a key voice for the development of Downtown Brooklyn, inserting itself, critics say, into the debate over a plan to build a Nets area and high-rises at the Atlantic Yards. It has spent some $200,000 on lobbying expenses. Inserting itself? That's what any lobbying group does, so the Times doesn't need to quote phantom "critics." It's not clear whether the DBP has spent $200,000 specifically on AY, but it's definitely been lobbying, as described below. And, for the umpteenth time, there's no at the Atlantic Yards. Atlantic Yards is a project, not a place. The plan is to build an arena and high-rises at the Atlantic Yards site. It's nearly six years later and they can't get it right. Numerous DBP officers and staffers testified on behalf of Atlantic Yards at various meetings and public hearings held by the Metropolitan Transportation Authority (June 22, June 24) and the Empire State Development Corporation, or ESDC (June 23, July 30, July 31). "I don’t want to be standing here... 50 years from now talking about how we lost the Nets like the Dodgers were lost in 1957,” testified Chan on July 31 at an ESDC public hearing. In July, when scores of other new condominiums were not selling, and developers risked default, Mr. Bloomberg and the Council stepped in to announce a $20 million pilot program to buy the empty units and use them as affordable housing. “Private developments that sit vacant or unfinished could have a destabilizing effect on our neighborhoods, but we’re not about to let that happen,” said Mr. Bloomberg. Actually, Mr. Bloomberg most likely fostered some of the real estate speculation with policies that invited development. But even those who say the mayor’s development record is mixed credit him for taking a long view. D'ya think Bloomberg "most likely fostered" Atlantic Yards with his decision to let the Empire State Development Corporation shepherd the project without any role for the city's Uniform Land Use Review Procedure (ULURP)? After all, it was a decision that even former Deputy Mayor for Economic Development Dan Doctoroff in hindsight agreed was a mistake. And whatever Bowles says, it doesn't apply to Atlantic Yards, which was not and is not a rezoning, but a state override of zoning for a particular plan and a particular developer. That's not the long view. Many people have called for Bloomberg to seek and get control of development at Ground Zero, but to date, he has given no indication that he wants that particular albatross. Still, his frustrations at past failures simmering just below the surface, he does not seem content to have his biggest contributions to the skyline be whatever has grown out of his administration’s comprehensive rezonings over the last two terms and the new Bloomberg LP headquarters on the Upper East Side. “We have to do the big projects,” he said at a recent press conference, his face scrunched in a grimace as he addressed the current condition of Atlantic Yards.